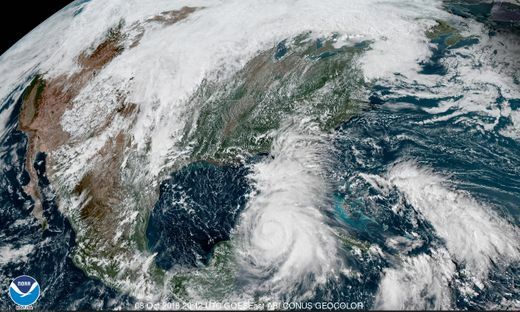 Hurricane Michael has strengthened to a category three storm, with winds near 193 kmph as it churns towards the Florida coast, the National Hurricane Center (NHC) of the US said. The storm is expected to make landfall on Wednesday. Florida Governor Rick Scott has warned residents to evacuate, BBC reported. Alabama is under a state-wide state of emergency ahead of the hurricane, along with 92 counties in southern Georgia and 35 counties in Florida. “Strengthening is expected overnight and on Wednesday, and Michael is forecast to be near category four strength when it makes landfall in the Florida Panhandle or the Florida Big Bend area,” the NHC said in its latest bulletin. “Weakening is expected after landfall as Michael moves across the south-eastern US,” it added. The Florida governor called Michael “a monstrous storm” and urged residents to listen to officials. Governor Scott warned in a news conference that Hurricane Michael is a “massive storm that could bring total devastation to parts of our state, especially in the panhandle”. He added that it is predicted to be “the most destructive storm to hit the Florida panhandle in decades”. Around 120,000 people have been warned to evacuate along Florida’s coast, where schools and state offices are to remain shut this week. Scott warned that he may order more evacuations due to the size of the potential storm surge.